For a long time now, I have been pushing for Jersey to introduce on street, separated recycling bins I was very pleased, then, when I saw for the first time in Jersey a similar one in the High Street, here in St Helier. It was only the next day that I realised, much to my displeasure, a big, golden 'M' on a bright red background on either end. The bin was sponsored by McDonald's! Only last week in the States, I raised concerns about going down the route of having all of our public services 'sponsored', rather than paid for by public funding, be that in the form of taxes or rates. I did not see this as a real risk, but after visiting Malta for two days over Easter and noting that their road signs were sponsored by HSBC, I cautioned that I, for one, did not want to go down the route where the whole island has become 'one big advert'. Sure, corporate sponsorship has a place - but normally this is restricted to charity events (the 'round the island' walk or the Dragon Boat Race) or commercial events, such as Jersey Live. Some readers may of course welcome such initiatives: after all, the money for those bins is not coming out of the parish rates, so in that sense there is no cost to the parish. So the other consideration, is the appropriateness of the sponsor. Below is an open letter I have sent to the Constable of St Helier, expressing my concerns and asking him ten questions. Here is the e-mail. I will post his response when I get it. First of all, let me congratulate you on the appearance of the first 'separated' waste/recylcing bins in St Helier. I know we have spoken about introducing these in the past and I am glad that St Helier has taken the initiative (which I hope will be followed by TTS). What I am concerned about is the issue of Sponsorship: I am concerned on two levels. (It is perhaps slightly ironic that during the Freedom of Information debate, I warned of going down the Malta route, where even their road signs are sponsored by HSBC). I would question whether it is appropriate at all to have these sponsored, but putting that concern aside, I am concerned about who the sponsor is. You will be aware that Jersey has particular problems when it comes to (childhood) obesity and diabetes. Whilst I am sure that McDonald's offer some healthy items on their menu, it seems to me that traditionally their offerings have been high in sugar, salt and fat. 1) At what level was the decision to have these bins sponsored made? 2) At what point was McDonald's chosen to sponsor this initiative? 4) Did any consultation occur with parishioners as to this decision? 5) Did any consultation occur with the Health Minister or the Medical Officer of Health? 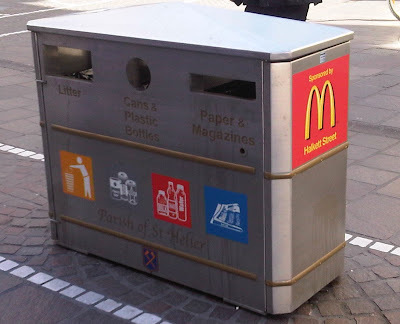 6) What is the overall amount of Sponsorship received from McDonald's for these bins? 7) How many bins are there of this nature? 9) Were any homegrown/local businesses (such as Jersey Dairy or Jersey Telecom) approached to provide sponsorship? 10) Is the sponsorship permanent. If not, please provide details. Goddamn Globalisation... corporations have enough power as it is. Even before I was vegetarian I would never eat at McDonalds because of the way they slaughter the animals. Not to mention their horrendous environmental record. We've all that is going on in jersey like murder child abuse over development run away immigration GST unemployment and nobody in the states with the balls to stand up to the minister's. And what's your problem Mac Donald have sponsored a bin if that is all you concern yourself with being a deputy I suggest you give up there is an awful lot of talk on bloggs and you go on about McDonald and gardens, if this is the caliber of states members today than this island is lost. These issues are all interlinked. The reason that child abuse has gone on in the past is that resources and policy making priority that should have been given to social legislation and looking after our youngsters at the time was neglected in favour of diverting resources to protect the interests of the wealthy and capital interests - not people, vulnerable families and the community. This is another manifestation of that same prioritisation. I will carry on using my position to campaign on issues when I think a wrong direction is being pursued. You know my commitment to achieving a fairer society in all areas. You will also be aware how I campaigned for the Haut de la Garenne Inquiry, and successfully won my amendment against all odds, to make sure that the prosecution processes were also included in the Inquiry terms of reference. It is a shame that you have nothing positive to say on the good work of the progressive element of the States.